Description: A timeless and modern diffuser come to fruition and create a luxurious classic look. 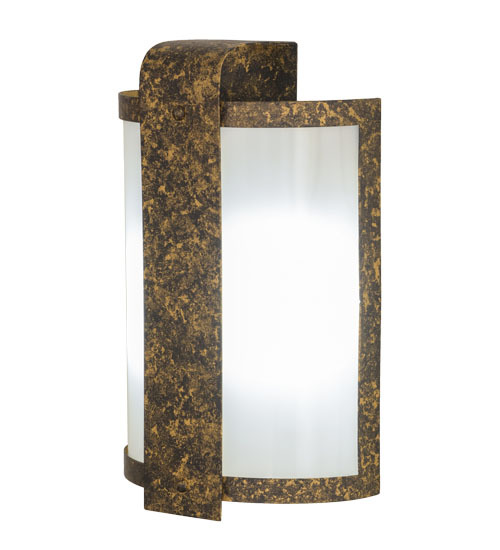 This eye-catching sconce integrates Old Gold finished Iron with a curved Statuario Idalight diffuser. The Eli wall sconce radiates soft lighting for a beautiful ambiance in hallways and other rooms in homes, restaurants, hotels and clubs. This ADA Compliant wall fixture illuminates with 2 Customer supplied, 4-pin Quad Tube 13-watt Compact Fluorescent Lamps (CFLs). Custom crafted by highly skilled artisans in Upstate New York, this fixture is offered in custom sizes, styles, finishes and dimmable lamping including LED. The 14-inch tall wall fixture is UL and cUL listed for dry and damp locations.